Where is the measuring stick? 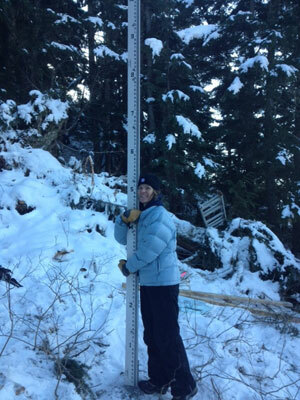 The exact location of the measuring stick cannot be disclosed for security purposes but we can tell you that the elevation at the base of the measuring pole is 1096 ft. +/- 1 foot (NAVD88 using Geoid Alaska09). Alyeska Resort was instrumental in getting the Alyeska Snow Classic up and running. When presented with this fundraising idea they were in full support. 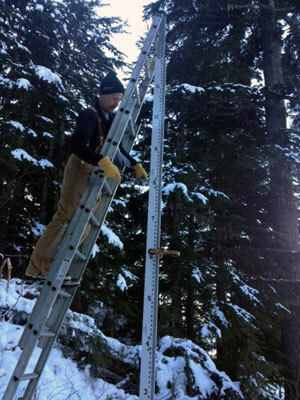 The Resort agreed to allow us to install the measuring stick on Mt. Alyeska and also donated man hours to clear the site and prepare the land for installation of the stick. We wouldn’t have an Alyeska Snow Classic without them. Who installed the measuring stick? The Measuring Stick was installed by Patrick Doran and reads to the hundredths of a foot,. Once the stick was in place, Jeremy Hurst hiked up the mountain with surveyors equipment to give us the precise elevation of the base of our stick. A huge thank you to to our volunteers for donating their time and talents. Patrick working on the Official Measuring Stick installation.